A couple having a “the talk” with their son. A divorce can be a difficult time for any family, but communication is important. The children need to understand that they aren’t responsible for what is taking place. They also need to realize that both parents love them and want to be a part of their lives. This can help children to deal with the many changes that will take place with a divorce. It is a good idea for the parents to sit down with the children to discuss the issue of divorce. Some parents choose to do this with all of the children at one time. Others find it is better to do so with each child one at a time. This is often due to age differences as well as the individual personalities of each child. The responsibility of telling the children about the divorce should never fall on the shoulders of only one parent. A united front needs to be displayed from the start of it. The children will feel more secure hearing the information from both of their parents rather than just one of them. The children don’t need to know all of the details of why the parents are divorcing. It shouldn’t turn into a blame game where each of the parents tries to get the children to take their side in the matter. What they do need to know is that their parents won’t be staying together and how that is going to affect them. Give children time to take in the information that is taking place. 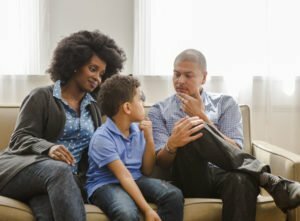 Even though they likely have an idea that things aren’t going well in the home, they may be shocked by the idea of a divorce. Let them know they can come to either parent with questions that they may have about it. It can be a good idea to have another meeting with both parents and all the children or each child one on one a couple of weeks later. That will give the children some time to deal with their thoughts about the divorce. They may be more ready to talk about it now than they were when you first told them about it. Be ready to offer your children more support during the divorce process. Some children act out in anger because of it. Others many become withdrawn due to their emotions. It is important that their needs are addresses as too many parents are too wrapped up in their own feelings over a divorce to provide their children with the support they need. Older children may press for more information as to why the divorce is taking place. Parents need to have a plan of action as to how they will handle such questions. If one of the adults has been having an affair you may decide it is best not to disclose that information to the children. This is a personal choice that you need to make before you sit down to talk about the divorce with the children though. Parents need to come to terms with the concepts of the divorce before the children are approached though. The children need to be reassured that they will be fine through all of it. That can’t happen if they get the impression that their parents aren’t okay with what is going to be taking place. Try to share some basic plans with the children as well. For example you need to tell them what the living arrangements will be. You also need to let them know when the changes will be taking place. This way they can start to prepare for what is ahead of them. When children are involved in what is going on with a divorce they tend to deal with it better. They don’t feel like they are just being thrown into the middle of what is going on. A divorce is never easy for anyone, especially when children are involved. Yet it can be a process everyone gets through if you are willing to put your differences aside and work together to come up with a good solution for everyone. Remember that more times than not, this is not their choice. Age appropriate honesty is always the best way to go. Answer their questions as direct as possible. Keep your emotions and opinions about the situation to yourself. Many times children will not want to upset anyone and therefore will not share their feelings or thoughts to avoid affecting how their parents feel. Have a plan. Know what you are going to say. Explain to your children what will happen and how it will happen. Children are often affected by the “unknown” so the more you can alleviate that then better. If there will be a new schedule tell them what that is. If they are moving explain to them what will happen. Allow them to have their feelings about it. It is uncomfortable to see your children sad, angry, hurt, confused, or upset, but they need to be free to experience their feelings and honor their feelings.